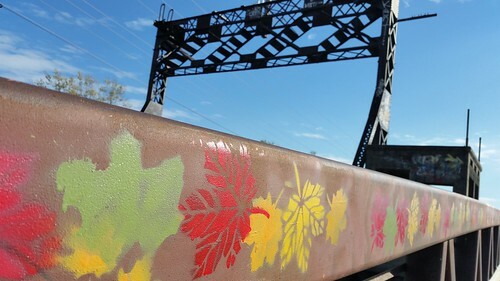 A bridge with rusty rail but different colored leaves painted on it. I liked the composition of this photo with the beam shooting from the left to the right, starting thick and thinning out towards the right. The brownish red of the bar along with the rest of the bridge components contrasts quite well with the bright blue of the sky and the bright colored leaves along the beam. It was clear that the intent was to liven up a drab-colored space and does so quite effectively.